Early this morning, @evleaks took to his Twitter account to show off a few different screenshots, apparently detailing an upcoming look for Samsung’s TouchWiz UI. 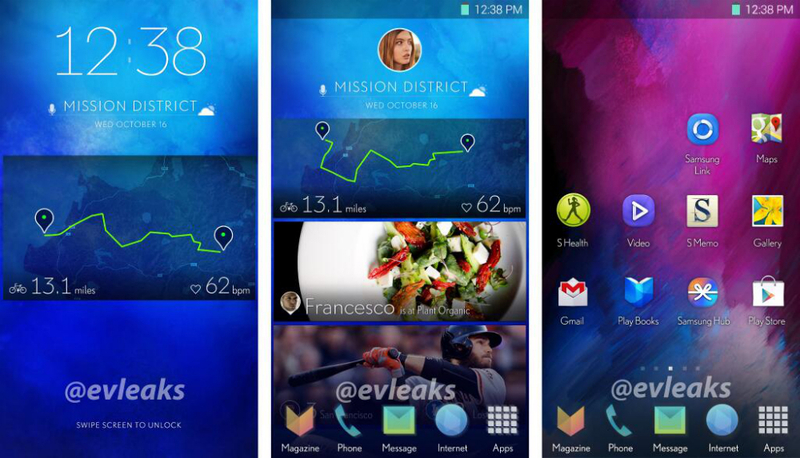 While we can’t confirm if this is the move Samsung plans to make for their smartphone UI, we can’t say it looks bad. It actually looks somewhat pretty. The first thing you might think is that this is Samsung’s look for Kit Kat. Last night, Kellen and I had hands-on time with the new Galaxy NotePro and TabPro tablets from Samsung, each of which runs a revamped version of TouchWiz on top of Kit Kat. That UI didn’t look anything liked these leaked screenshots, as the notification bar actually sported white icons and text, just like stock Android 4.4. As we can see in these screenshots, Samsung is apparently sticking to the green battery icon for now, as this could be a revamped version of TouchWiz just for smartphones. It would be interesting if the company decided to have two separate versions of their skin for phones and tablets, so we wouldn’t put our money on that idea. In the pictures, we can see that Samsung has found a new love for flat icons as well, which reminds us of HTC and the release of Sense 5. Either way, these new shots don’t give us much detail, but if this version does come to fruition, we would be sort of happy about it. It’s definitely an improvement over the current look of TouchWiz. What do you think? Does it look better or worse in your opinion than the current TouchWiz?